Top of the morning to ya! It’s Monday so get some coffee and buckle up for a great week. I laugh at Facebook links, Twitter links, and the spam emails that simply say, “Click here for a free gift.” The ad isn’t funny. It’s knowing that we are so desperate to get “free” stuff that we lay down all inhibitions in the euphoria of knowing we could be getting something free. I’m not standing in judgement. Anne knows that when we go to a conference, I look forward to SWAG (Stuff We All Get). I’ll walk from table to table to pick up free pens and key chains as if the Mayan calendar was right and my survival the coming apocalypse would come from the pens and key chains. We see free…and we leap. But, for some reason, we have a gift available, and instead of receiving it, we go about attaining it with alternative ways. I’m slowly going through Ephesians this month and got a great reminder. My pen couldn’t underline my new bible fast enough. It was screaming at me from page 976. I pulled out my phone and instagramed the passage. The subtle reminder to me in the midst of my monday rush: you didn’t create this life yourself…you didn’t earn it…you couldn’t accomplish it. It’s a gift. It’s free for you to receive. I guess today the Holy Spirit felt I needed that reminder. Maybe I’ve taken it for granted. I guess I needed to come to a greater appreciation of His love for us. Without Jesus…where would I be? 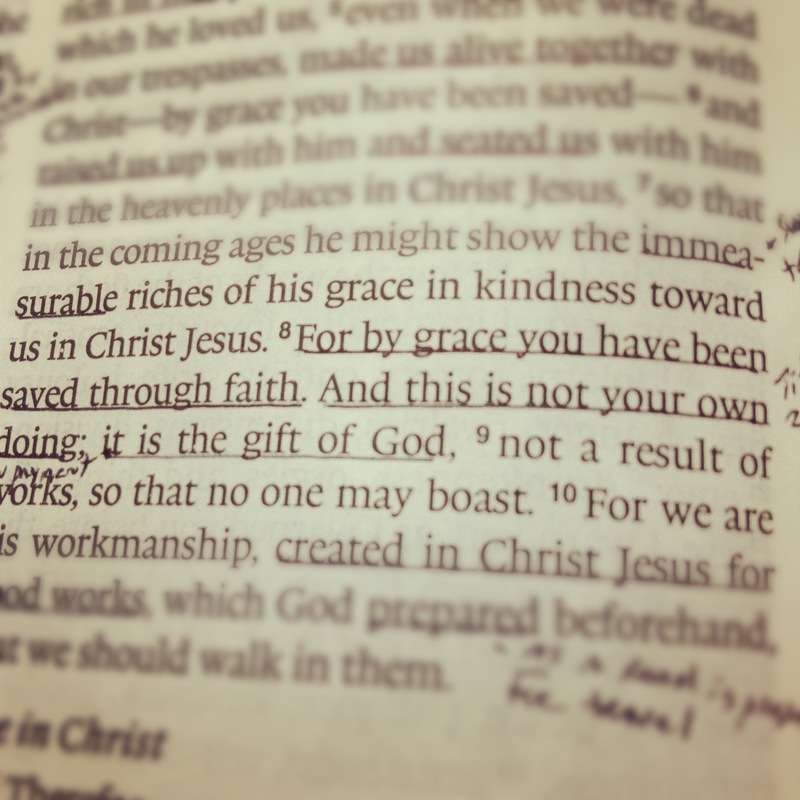 I recognize the cost comes as we follow Christ…but that’s for another blog on another day. #1 – Sunday was amazing. When I showed up to youth group last night, the teen were buzzing about Sunday morning. That, to me, is a litmus test for a speaker. How did the next generation receive them? Andy Raatz did something extraordinary. He imparted his heart into ours. It was like the sanctuary was an operating room and his heart was transplanted into our lives. What a great response to the altar!!! I had a few talks with some people who were messed up from yesterday…in a good way. What a joy to see individuals seeing their world with new hearts and having a passion for the lost. If you missed the message, download it from iTunes later or hit our website. 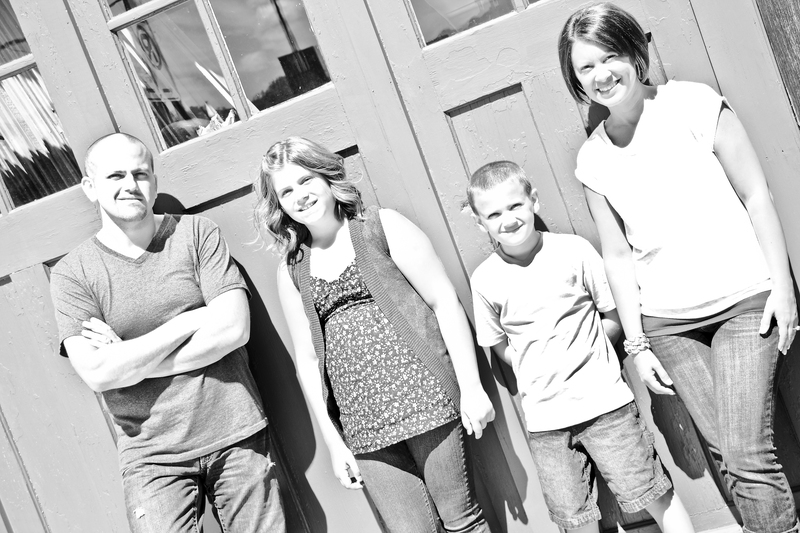 #2 – Missions Emphasis is concluding Sunday!! Every November, we concentrate our focus on outreach (local, national, world). Our two-week emphasis centers our hearts upon the lost, increase our passion, and challenged us to get involved. We’ll be taking up our “faith promises” on Sunday. A faith promise is a monetary goal or a pledge that is set between the you and God for the support of world missions. This goal is set for one year. Anne and I have supported world missions since we were teens and would encourage you to join us in giving to world missions. #3 – Missions Emphasis includes giving to the Kalamazoo Gospel mission!! During our emphasis we’re teaming up with the Kalamazoo Gospel mission. We’re challenging everyone at Kfirst to bring coats in to bless the mission. If you have a coat and/or want to buy one to donate, please bring into the office during the week. #4 – Chapel Service and Hymn Sing is coming up this Thursday! If you’re one of our senior adults, you don’t want to miss out on an amazing time. Our pastoral team has been rotating through and bringing the Word. I absolutely love our time of prayer at the end! #5 – Sacred: Kfirst Christmas Series. I can’t wait to launch our Christmas series this coming December. My desire is to bring back the sacredness to the Christmas story that, for some, has become generic and ordinary. Join us as we present “sacred” in December…better yet…invite a family or two and let them hear about the Lord who was sent to bring them life. That’s all I have today. Enjoy the Lord’s free gift to you. Enjoy giving that gift to someone else. Posted on September 17, 2012 September 18, 2012 Categories UncategorizedTags kfirst, love, shema, Sunday, truth, updateLeave a comment on Are you looking for the key to God’s hand? Happy Monday! The Lions won so it’s a happier Monday for me. That was the question that was buzzing yesterday at KFirst. Some have figured it out…some are still scratching their heads. What an outstanding day yesterday at KFirst! If you were not there, we had a packed day of ministry that makes it exciting be a part of an amazing church community. #1 – KFirst kicked off our series “Dust” yesterday. We have taken to heart the focus of John 15:16, “You did not choose me, but I chose you and appointed you that you should go and bear fruit and that your fruit should abide, so that whatever you ask the Father in my name, he may give it to you.” Jesus sees something in me: He thinks I can be like him. He is our rabbi/teacher and we are to choose to follow him. We wrapped up with a TRUTH: Following Christ is a moment and a process, entrance and walkway, new life and new lifestyle. If you missed the message, download it from iTunes or hit the website. 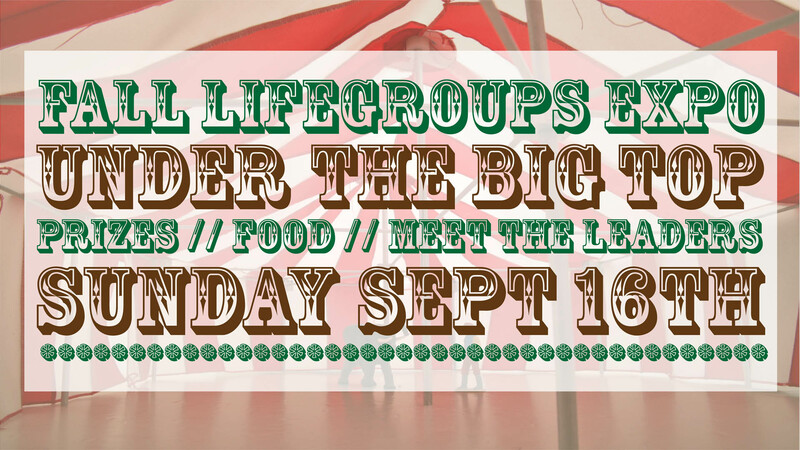 #2 – Lifegroups Expo is coming up THIS SUNDAY, September 16th. It’s happening after church, outside under the “big top” tent. We’ll have food, games and Target giftcard giveaways. Come out to discover our new groups, meet our leaders and get more information on our all Lifegroups. For more info, contact the church office at (269)329-1977 or the KFirst Facebook. #3 – Our Next Gen ministries had their fall kick off. Kidzone joined us for worship. I love seeing the kids in service with us and having the families to sing together. Don’t forget, they are dismissed while the offering is taken. I can’t thank our kid’s ministry volunteers enough for the phenomenal job they are doing. Thank you for pouring into our kids on a weekly basis. Ethan loves his BLAST classes and can’t wait to go every week. Real had a great turnout last night. Give their promo video a look. My daughter came home so pumped about what Jesus is doing in her youth group. If you have students ages 6th grade to 12th grade, bring them on out. theHub had their fall launch. 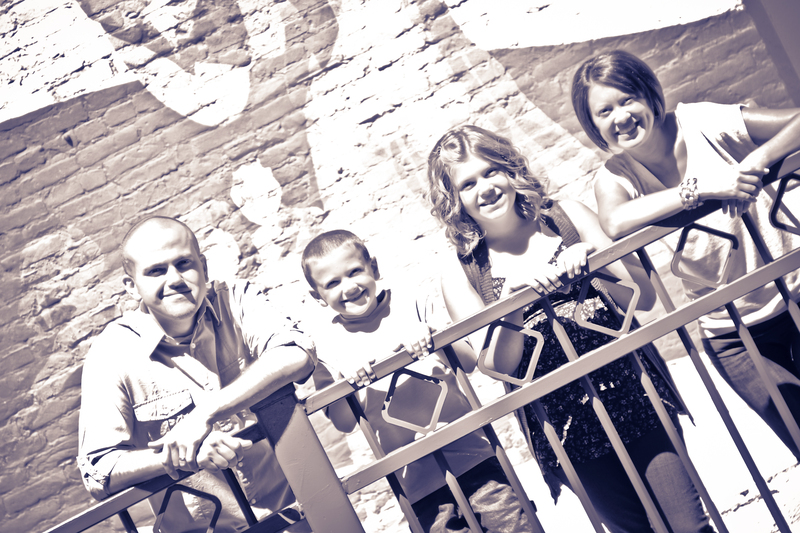 Check out their promo video…better yet, show a young adult and invite them out to a life-changing venue. I’m so excited about Pastor Todd’s and Tara’s passion for our young adults. If you have or are a young adults, get plugged in to theHub. #4 – Annual Business Meeting is coming up September 26th. Our trustee nominees will be presented in a handout at the information center and in the church office on Sunday. I’d ask that you intercede over this as we approach 3 trustee positions with prayerful hearts. I think the nomination committee did a great job in giving us choice candidates to serve. #5 – Tailgate Party is almost here. 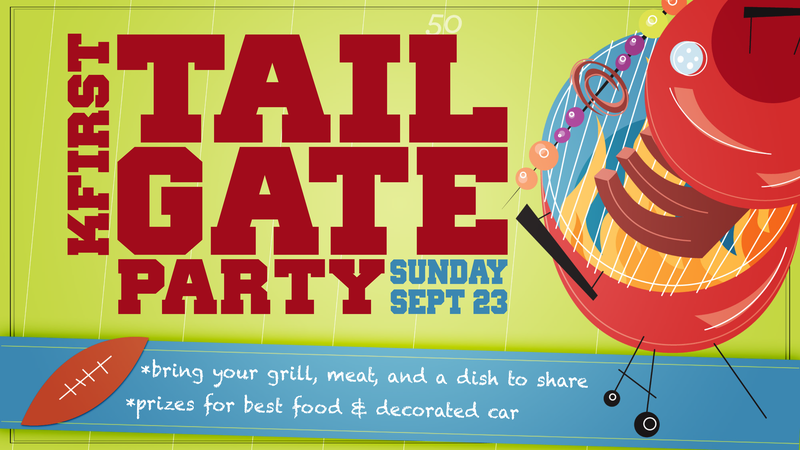 September 23rd is going to be a great day as we celebrate our Annual State of the Church message and celebrate outside at our Tailgate Party. Park your car on the west side of the building when you come Sunday morning and stuff your cooler full of food for your family. Most people choose to wear their favorite team’s T-shirt/sweatshirts during the tailgate. I just ask for the MSU stuff to be toned down. OSU paraphernalia will not be tolerated :)…not that I’m picky or anything. #1 – What an awesome day at KFirst yesterday morning. Pastor Matt brought a great word “Connect the Dots.” If you missed it, check out the KFirst Website or download it in iTunes in the next few days. PMatt shared his testimony and challenged us with a TRUTH: “The next generation will know Jesus because of people who chose to obey Him today” I found myself reminiscing of those people in my life that have influenced me and are the “dots” in my life story. It was an amazing site to see our students and school faculty come forward for prayer as they are challenged to live out another TRUTH: “How you live your life today has the potential to change someone’s life tomorrow” Awesome job Matt! #2 – Tomorrow is, officially, the day where all of our children will be school. Pray over their transition into a new school year, a new schedule, and for some, a new school surrounding. Pray over their connections to peers and faculty. Pray for protection for them. Pray for the faculty and administrators (teachers, principals, custodians, bus drivers, etc). Most of all, pray over outreach possibilities your children will have as they live out Christ in the one of the greatest mission fields in the world. #3 – Today is Labor Day. Labor Day is a creation of the labor movement. It is dedicated to the social and economic achievements of American workers. 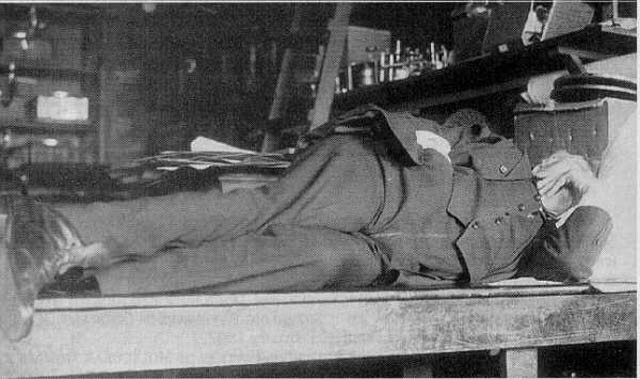 Oddly enough, Labor Day is seen as a day of rest. Find some time today find some rest. But also find a way to invest in your marriage, family, and/or friendships. Have a BBQ, invite some friends over, and celebrate friendship. #4 – This is a the week we launch “Dust.” As I stated this past Monday, this series has been developing in my heart for quite a few months. The old saying, “May you be covered in the dust of your rabbi.” Reason being, years ago, disciples who closely followed their rabbis along sandy, dirty roads would get covered, quite literally, with the dust of their rabbi. Join us on this journey as we launch a new series that explores our endeavor to follow Jesus, our teacher/rabbi. I’m so excited to travel this journey with you. #5 – DON’T MISS WEDNESDAY!!! Night of Worship and Prayer is this Wednesday at 6:45p.m. It’s going to be a great time of soaking in the Lord’s presence as we intercede over our school year. #6 –Pastor’s Prayer has changed to Wednesday at 9:30 JUST FOR SEPTEMBER. I can’t wait to connect with the prayer team and launch into the fall. In case you missed our video announcements, here you go. That’s it for this Monday…I love serving KFirst and cannot WAIT for this Sunday. This is the official launch of the PDave blog! It’s something that I’m completely stoked about. It’s not necessarily my first stab at it. My “ramblings” began a few years ago. I have to say, I have been hesitant getting back into it. But after a long hiatus and a lot of encouragement from the KFirst team…let the rambling resume. KFirst weekend thoughts (Monday) – I believe in celebrating what the Lord has done and looking forward toward what He has in store for us. Monday’s give me a chance to break down our weekend as create a vision for upcoming events. Thursday’s Rambling – It’s almost self explanatory; the ramblings of a man pursuing Jesus. Monthly Marriage Rambles – God has given me a passion for marriages. I can’t say that I’m the source of all marital advice, but it’s a journey that the Lord has placed my feet upon. Anne and I always say: the two things that make marriage work are 1. Jesus 2. Laughter. Now that the preliminaries are out of the way. #2 – We are in our current series “Parables.” Read Luke 10:25-37. A TRUTH we gave: Unattended injuries render us vulnerable to greater injury. We challenged everyone to walk as agents of mercy and healing. We walk realizing a neighbor is “one who is like us.” Not in looks or in class. They are like us in that we should have empathy for them when we realize how similar their situation is to our own experience. We shared 2 Chronicles 28:1-15 and how it parallels the Good Samaritan. Remember: Each person must understand the needs of his neighbor in order to become a neighbor. Don’t just walk by your neighbors…step outside of your comfort zone and get involved. #3 – We’ve just completed 5 points of outreach in the past few weeks. 3rd Annual KFirst Car Show – Amazing community connection that is building into a KFirst tradition. I can’t say enough thanks to those who took time to serve and give to make these possible. Thank you for all that you do. #4 – This is a great time to invite people to church. The fall is a perfect time to live out what we’ve been preaching about on Sundays. As we gear up toward September, take a moment to connect with those in your neighborhood and look for way to invite them out. We wrap up our series “Parables” this Sunday and get ready for our new series: “DUST.” I can’t wait. #5 – Look for ways to connect with your kids before school starts. Give them one last great memory of the summer before they head back to school. That’s it for this Monday…I love KFirst, cannot WAIT for this Sunday.